Below you can find our guest books with comments from our most recent guests. If you have stayed with us and would like to add a review, click on ‘write a review’. Please feel free to do so: we really appreciate your feedback! Super emplacement dans Amsterdam. Très bon accueil. Appartement très propre et bien équipé. Vraiment parfait. We absolutely loved the apartment. It is in a great part of town with everything in walking distance. The check in and check out was great and we loved being able to make our own coffees and convenience meals to save ourselves a little money. Lovely clean apartment in a great location, thank you for your warm welcome! Fraai appartement midden in het centrum van Amsterdam met fijne en vriendelijke gastheer. Geen ontbijt in de prijs inbegrepen. Tolle Lage. Freundlicher Empfang. Ausstattung, Größe, Bad etc. alles wie beschrieben. Excellent location, fantastic host, lovely apartment. The apartment is located in a very central area, however is also on a quiet corner and is not at all noisy. The apartment is cosy and well maintained. Guido the host is very helpful; we ate at two restaurants he recommended and he also organized the taxi back to the airport, which we needed for the middle of the night. Highly recommended. Absolutely beautiful stay. Desirée who greeted us was lovely and gave a tour of the apartment, showed us to nearest ATM and pointed out good nearby restaurants and locations. The apartment was well located, private, comfortable, modern and clean. Nothing felt cheap. Thanks so much. Convenient and central location. Location is very easy to get to by metro from central station but we paid 20€ for taxi because of rain. Hairdryer, great wifi, comfy bed, microwave and fridge all useful. Not equipped for cooking but who wants to cook while on vacation. Free bottle of white wine was a nice touch. Our flight was delayed 45mins and we arrived late but Guido still welcomed us with a big smile. He lives upstairs and reachable by text. He spent a good amount of time introducing Amsterdam to us, supplying with helpful maps, etc. His website is also informative. There is a sewer pump sound upon flushing toilet and shower. We got used to it. If you are a light sleeper, best to being ear plugs just in case and you will be fine. Not a deal breaker. The apartment fabulous great location and the view awesome! Guido fantastic host!!! Recommend!!!! Premium apartment in beautiful location! The location of the apartment was the highlight, we were right in the middle of old Amsterdam, we would sit on the bench beside the canal in the evening and watch the sun go down, it was stunning. Когда рейтинг не говорит ни о чем… Кофемашина (вкусный кофе получается), ванная комната (удобная ванна). Разрешен поздний заезд. 1. Хозяин живет в квартире сверху и он очень щепетильный, рассказ о правилах дома затянулся на 20 минут. 3 раза я был оповещен, что квартира не для вечеринок. 2. Первый раз я бронирую номер (комнату, т.к. это сложно назвать квартирой) с кухней, которой фактически можно пользоваться на 10% – можно только разогреть еду в микроволновке или подогреть суп в кастрюле или сварить яйца. Я всегда бронирую аппартаменты или номера с кухней, т.к. имею жесткую диету и мне важно приготовить самому себе завтрак и обед. Здесь я получил письмо уже после подтверждения резервации, что кухня номинальная и аларм-пожарные системы очень чувствительные к дыму. Если бы не отмена рейса и глобальная усталость – я бы потребовал отмены резервации и возврата денег, либо разрешения готовить, но сил на это не было. (Цитата из письма: “My 2-person non-smoking guest apartment is about 35 m2 and has its private entrance directly from the street. It is equipped with an own shower, bath, toilet (with Indian shower), sink, hairdryer, television, wireless Internet connection and a small kitchenette with micro wave for making coffee and tea and warming up ready-to-eat food (but not for cooking or baking because there is no hood/extractor and a very sensitive fire alarm and ). Just around the corner you’ll find a very good lunchroom Puccini (for breakfast and lunch) and also several good restaurants. Bike rental is within 5 minutes walking distance.”) 3. По центру комнаты стоит деревянная винтовая лестница и если вы 170 см и выше – вы можете удариться об эту лестницу, ее очень неудобно обходить. Но на нее можно складывать одежду, т.к. шкафа с вешалками нет. Я понимаю, что вы не можете ее просто разрубить и выбросить, иначе вы провалитесь вниз. Но это несправедливо, что она занимает половину комнаты. Fantastic stay in a beautiful city. Very private – everything spotless, clean and like new. Host is warm and friendly and close if you need any help. Could easily self-cater for breakfast; tea and coffee provided and supermarket close by. Cable TV so English channels available. Easy access to Metro and trams and close to everything with wonderful views. Will definitely return. Месторасположение просто волшебное, рядом каналы, очень тихо и не многолюдно. Хозяин апартаментов очень подготовлен – все рассказал, все показал, очень помог. Dear Guido, thanks for your warm hosting. Jessie and I had a great time in Amsterdam. The Netherlands is a place full of peace and energy at the same time, definitely an inspiring country that I would love to visit again. Thanks again! Cher monsieur Guido, Nous vous remercions pour votre accueil ainsi que de vos conseils pour les restaurants. Nous avons passe un excellent séjours. Merci pour tout. Querido Guido, Si Amsterdam nos ha parecido maravillosa, mas maravillosa ha sido tu hospitalidad y tos consejos, que hicieron que nuestra estanca el esta cuidad haya siso genial y perfecta. Volveremos y esperamos que pueda ser a tu casa. Perfect stay. Immaculate apartment in a perfect location. Wouldn’t hesitate to book again. Great location and the most organized host ever! From Guido’s tips on the best way to get to the apartment, to restaurant recommendations and confirmation emails, it was a great experience. The apartment is lovely and very quiet despite its central location. I’ll be back! Thanks Guido for such a comfortable stay! It was particularly helpful to have all your tips, info and map. We have been in Amsterdam only for 3 nights and want to come back for more in the future. This is in part due to your comprehensive approach to people being able to staying in your practical apartment. Thanks again and all the best. Guido ist ein sehr freundlicher und hilfsbereiter Gastgeber: viele Tipps und Hinweise für das gesamte Umfeld, umfassende Erläuterungen für das Apartment, flexibel für An- und Abreise. Das Apartment war blitzsauber und mit allem wünschenswerten Komfort ausgestattet. Es gibt sogar einen kleinen Abstellraum und – fast eine Seltenheit – genügend Möglichkeiten, Jacken, Hemden, Blusen etc. aufzuhängen. Nicht zu vergessen: das Bett ist ausgesprochen bequem. Weiteres Highlight ist die Lage des Apartments an der Ecke einer ruhigen Gracht mit der Amstel und trotzdem nach wenigen Schritten mitten im Leben. An der Ecke steht gleich eine schöne Bank für den Sonnenaufgang. Zum Restaurant FRENZI an der Ecke sind es vielleicht 20 m, sehr praktisch für ein wirklich gutes Essen. Flohmarkt, Einkaufsstraße, Abfahrt für Grachtenrundfahrten, Hermitage, der Dam, alles innerhalb von 5 – 10 min zu Fuß zu erreichen. Tipp: Falls Sie mit der Bahn an- und abreisen, nehmen Sie doch den Canal Bus; von oder nach Amsterdam Centraal – also Grachtenfahrt gleich inklusive. Hier gibt es NICHTS zu beanstanden. Wir werden dieses Apartment bei unserem nächsten Besuch gerne wieder buchen. Dear Guido & Kees, Thank you for a wonderful end to a 7 week trip. The apartment is very special and your thoughtfulness was fabulous! Amsterdam was a lovely place to wind down & enjoy. Many thanks again. A quiet corner in the center of the city. A very beautiful part of Amsterdam. A cool heaven from the heat. Thanks! Great city, great apartment, great host. Thanks Guido! Excellent apartment and the perfect host. Everything. Guido was great- he was there to meet us, provided lots of useful info. (And a bottle of wine!) And texted during our stay to make sure everything was OK. The perfect host! Apartment location was spot on and it was immaculate. Would highly recommend. Thanks you for all! You’re welcoming was amazing! The place of the apartment is perfect and the district is so lovely. And the apartment is so cute, and with a lot of equipment very useful! So, it’s just amazing! Kodune mugavus kesklinnas. Suurepärane asukoht, kõigile vaatamisväärtustele, ühistranspordile, söögikohtadele ligi, samas vaikne. Sõbralik omanik, kohv, tee olemas, vajalikud köögimasinad ja tarvikud samuti. Thanks for a perfect stay in your apartment. Would definitely return! Brilliant host! מארח מאוד אדיב – הוא הסביר לנו על כל האזור, כולל המלצות על מקומות לטייל ולאכול וסופרים באזור. החדר היה נקי ועם מכונת קפה ומקרר קטן. המיקום מצויין – קרוב למרכז אך עדיין מאוד שקט. Sehr freundlicher Gastgeber, perfekte Lage, gute Ausstattung usw.! Alles top! Good! Like the location of the apt overlooking the canal and close to the Dam sq and Amst Central. The room was clean and fully furnished with kitchen cutleries that made us easier to heat up the food. Guido, our stay in Amsterdam has been exceptional! We found your guest apartment to be perfect for us. We had everything we needed when “at home”, the area is quiet for relaxing and sleeping, but also close to all the activities. The apartment is so clean and cozy, we truly felt at home and very comfortable. We both think Netherlands is a very beautiful part of the world and we hope to visit more of it on our next trip. Thank you! Todo genial: La localización y lo atento que es Guido, el propietario. Volveremos!! The host was very welcoming and accommodating. He greeted us with a nice bottle of wine and gave us a detailed explanation of the area and what he recommends. The location was great, walking distance to all of the major attractions, it was very central. Nice clean apartment. 100% will stay here the next time I visit Amsterdam. Guido was extremely helpful when we arrived in Amsterdam. He showed us the facilities, gave excellent recommendations for nearby restaurants, and provided information about city sights and activities. The place is conveniently located (we pretty much walked everywhere! ), and we would definitely stay there again. Su situación privilegiada, en pleno centro de la ciudad y con las maravillosas vistas al canal. Guido es un magnífico anfitrión, te indica q hacer, q ver o dónde comer. The location of the apartment was excellent with a great view and convenience. Guido the apartment owner was excellent in his help, and would advise anybody travelling as how two to use the apartment. Guido was welcoming and extremely helpful with everything from printing boarding passes to arranging a lift to the airport: nothing was too much trouble. Excellent location right on a canal in the center of everything or close walking distance. Very cozy in cooler weather but below street level with a glass door for access and light so not good if you are claustrophobic! Dear Guido, thank you so much for your kindness and excellent restaurant recommendations during our stay. The apartment is excellent and we hope to return. Dear Guido, thank you for welcoming us in your apartment. We had a great time here in Amsterdam. Your tips were very helpful. Hope to meet you again anytime ☺ Thanks! Vielen Danke, wir haben einen sehr angenehmen Aufenthalt! Die Lage des Appartements ist ideal und die Unterkunft ist top! Wenn ich das nächste mal mit meinem Mann Amsterdam besuche, komme ich gerne wieder her! Dear Guido, we have thoroughly enjoyed our time here in your apartment in Amsterdam. It is all very well thought out and appointed and at such award full central location. We will certainly recommend your apt and we hope that we will visit again. Dear Guido, thank you for your welcome and the bottle of wine, a lovely way to start a holiday. We will certainly recommend your apartment to our friends. We really had a wonderful stay here in Amsterdam and fantastic weather. Hope to see you again! Thank you for giving us such a warm welcome. The tips you gave us were really helpful. Puccini’s chocolates were heavenly. We both really enjoyed Amsterdam and would definitely come back. Thank you for the wine: it helped us start the birthday weekend. Thank you for a warm welcome, we have enjoyed ourselves very much. Puccini’s great food and the chocolates: to die for. The apartment is well situated and the information you gave us was very helpful. We’ll tell our friends back home al about Amsterdam. Dear Guido, Thanks for your lovely welcome! The apartment is very nice, the best position to explore Amsterdam….we had a great time here! We will recommend your apartment to all our friends who would like to come to this beautiful city. We hope to return a.s.a.p. Thank you for all!! Thank you Guido for everything during our short 2-night stay in your apartment in Amsterdam. It is a beautiful location and a beautiful apartment too. Thanks for your kindness and happiness to help. Hopefully be seeing you again in the near future. Proost! Dear Guido, thank you for letting us have the opportunity to stay in your beautiful and well-equipped apartment. It is our first time in Amsterdam and we’ll definitely be back, hopefully in the summer next time when slightly warmer. We can recommend a canal cruise and also the Hop on-Hop off bus tour. Anne Frank’s house is amazing and very emotional but well worth getting up early to queue for. We took up your recommendation for the Crua Thai Classic Restaurant and had an excellent meal on our 7th wedding anniversary. Lieber Guido, Unsere 4 Tage in Amsterdam waren traumhaft. Jedem Tag Sonne! Die Lage hier ist super. Ein nettes Kaffee gleich um die Ecke und jede Menge Kneipen. Mit dem Rad durch die engen Straßen zu fahren macht Spaß! Wir kommen wieder und danke für deine Tipps! Es war ein super Kurzurlaub für uns Andrea & Markus aus Köln PS: Der Oude Genever is lecker! Lage, Einrichtung, Größe? Mr. Guido Pouw. Gostei muito da localização e da acomodação . O apartamento é bem equipado , limpo e confortável. Negativo: Senti falta de uma pessoa que pudesse nos orientar a qualquer hora , apesar do Guido ser superatencioso ! The apartment has an amazing location with a great view once you walk out. – The apartment is central. We were able to walk everywhere (we only had to use the metro just once). few restaurants are around. – The host/owner was extremely helpful and spent a good half an hour with us explaining the area around us/shops on a map. The owner has an extensive folder with all required information available in the apartment (restaurants, shops, etc .. ). The apartment was fantastic. We would definitely book it again for our next stay and recommend it for friends/family. Sehr zentral gelegen, sehr gemütlich, sehr sauber, freies WLAN, Kaffeemaschine, Wasserkocher, Mikrowelle, Kochgelegenheit, Badewanne/Dusche, Supermarkt um die Ecke. Sehr netter Vermieter 🙂 Da kommen wir gerne wieder 🙂 Dear Guido, we really enjoyed our stay in your apartment. We visit Amsterdam every 3 years, so we see you in 3 years ☺! Thanks for all, Patrick & Elke. From the moment we arrived we could not fault this beautiful apartment. The owner Guido welcomed us even though we had quite a late arrival. He was so friendly and helpful, showing us the best sites to visit and had a bottle of wine in the fridge for us too! The apartment is in a perfect location and has everything you need for a home from home. Guido kindly let us store our bags too because we had a full day before our flight. I cannot praise the apartment highly enough: just go, you won’t be disappointed. Konumu, rahatlığı, yatağı tvsi falan hepsi mükemmeldi. Ilgi alaka da oldukça güzeldi. Tavsiye ederim şiddetle. Sadece yoldan merdivenle aşağı kota iniliyor 1 metre kadar. Mükemmel kanal manzarasını seyredemiyorsunuz kalırken. Ama zaten gün içerisinde yeteri kadar gördüğünüz için çok da problem olmadı bizim için. Overall, an excellently located apartment within easy walking distance of everything near the City Centre. Comfortable bed and great WiFi. Guido is a wonderful host. We had a great time with the central location and easy walking distance to everything. A little tricky navigating stairs but Guido was always there to help. Dear Guido, thank you for the wonderful accommodation here in Amsterdam. We appreciated your personal attention to our stay and you certainly have covered it all. The proximity to the main tourist prevents was very convenient. The room is very spacious, clean, comfortable and well equipped. 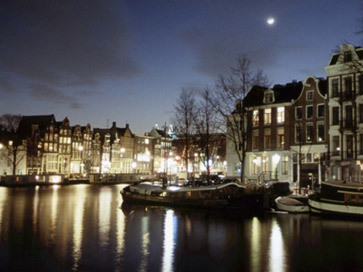 Your contact details will be kept safe and we will speak highly of Amsterdam Canal Guest Apartment. Amazing apartment and great location, really enjoyed our stay. Guido was a lovely host and so welcoming. He even left us a lovely bottle of wine. Would highly recommend and will definitely be back the next time we visit Amsterdam. Gostámos de tudo. Desde a localização à limpeza e comodidades. O nosso anfitrião Guido deu-nos informações muito úteis à chegada e mostrou-se sempre bastante prestável durante a estadia. O apartamento está muito bem equipado. Fica no centro de Amesterdão, à beira do canal, mas longe do barulho da cidade. Deu para fazermos sempre a pé todos os percursos! Der Gastgeber Guido ist enorm freundlich, offen und hilfsbereit. Kühlschrank ein wenig zu laut in der Nacht. Wir kommen wieder..:). El apartamento se encontraba en excelente condiciones. Disponíamos de todo lo necesario como para sentirnos en casa. El dueño, Guido, siempre muy atento y predispuesto a ayudar. Nos recibió con un vino como obsequio de bienvenida. Difícil acceso si se tiene alguna discapacidad. First of all the owner, Mr. Guido is a great host. I cannot stress how perfect the location of the guest is. You are so close to the Metro (4 min. ), Tram (4 min. ), Rembrantplein (6 min.) all in walking distances. The bars and clubs are right beside you but don’t disturb you because they are across the Amstel River. The place is really clean, with lots of towels and condominiums. We highly recommend this accommodation; Guido is a fantastic host and the setting of this very comfortable apartment is just spectacular! La proximité des lieux à visiter tout en étant très calme. Très joli quartier, au bord du canal. An excellent host will welcome you to this well-appointed, well-located and very comfortable apartment in Amsterdam. We couldn’t have asked for a better stay and will hope the apartment is available next time we come to Amsterdam! Tudo desde o camão, até a quantidade de água que cai do chuveiro, o astral, a companhia, o momento, o local, tudo o máximo, inesquecível, tudo…. valeu! A única surpresa foi o Guido não aceitar cartão de crédito, como é mencionado no Booking. Portanto quem for se hospedar lembre de levar dinheiro ou poder sacar no ATM. Dear Guido, Thank you for the apartment and your attention. We had lovely days here. Have a nice 2014, hope to see you again and thanks for all! Dear Guido, Thank you so much for your nice apartment and your wonderful tips to explore Amsterdam. We had such a wonderful long weekend and enjoyed it very much! We would come back any time to your house. We wish you a lovely start into the New Year and a good 2014. Thank you very much for having us. Dear Guido, we love the city of Amsterdam. We want to thank you for your hospitality, sympathy and your little advice. Happy to live in your apartment and your neighborhood is so beautiful. It’s cool. We love it we’ll come back! Thanks for being so helpful and kind with us. We have enjoyed Amsterdam a lot and the perfect situation of the apartment has contributed to make our stay so nice that we will be back to this same place when we visit this city again. Muchas gracias desde Sevilla. Dear Guido, Many thanks for your kindness and attentions that contributed to our great journey in your beautiful city. Thanks for a great stay at your place! Buenas Guido, Gracias por esta estancia tan agradable el apartamento es muy acogedor y aunque el clima no ha sido muy agradable hemos podido disgustar de esta maravillosa ciudad Amsterdam por tercera vez aunque no conocíamos volea sonto!! Saludos desde Granada, Andalucía en España. Dear Guido, we had so much fun in Amsterdam. Your apartment is such a nice place that we felt like home. Thanks for your hospitality. We will definitely be back and we know where to stay ☺ Until then: take care! Dear Guido, Thanks so much once more for your attention and kindness. We are so glad to have chosen your place to stay! We had great moments here and loved everything in this city. With best regards, we hope to be back soon. Dear Guido, we had a lovely stagy here! Thank you for providing us with ypur organized, clean and comfortable apartment, located at an excellent area and distance from the tourist points in Amsterdam. You’re also very kind. We are hopefully coming back to Amsterdam in some year’s time… we’ll definitely want to stay here again! Guido & Kees, thanks for the beautiful apartment and see you in 6 months! Guido, Você e minto simpático e organizado. Vesse apartamento nos sentimos em casa. Recomendaremos, boa sorte, muitos hospedes legais, beijos. Guido, we had a wonderful stay in this joyful guest house and the city of Amsterdam. Your recommendation of the Thai restaurant around the corner was great. Thanks for your hospitality! Die Gastfreundlichkeit des Vermieters. Sauberkeit und Lage des Zimmers sind sehr gut. The host was extremely helpful and accommodating, following up with a thank you email. Very comfortable stay with a great night’s sleep. The location of this place is perfect with easy access from railway station. Yet quiet and scenic. Will certainly recommend Amsterdam Canal Guest Apartment and will be coming back in the future. There is nothing to not like about this place – perfect indeed! Thank you Guido for such a comfortable stay. Many thanks! We very much appreciated our stay in your facility. Everything is just fine, including your hospitality. We hope to see you again, best regards. Guido, lovely apartment and fabulous location! I will be back in the near future and recommend this place to friends and family. Thank you for a warm welcoming. Das Apartment war äusserst sauber und geschmackvoll eingerichtet. Die Lage genial, mitten in Amsterdam, alles war zu Fuss erreichbar! Guido der Besitzer sehr nett und hilfsbereit! Wir kommen wieder! Dear Guido, Your beautiful apartment was a home away from home. Lovely on the canal, really relaxing and can’t wait to come back. Also it got Darren to propose!! Lot’s of love. Fantastic location! Extremely friendly and helpful owner and neighbour/friend who helped us while the owner was on vacation. Местоположение. Практически до всего можно дойти пешком. Есть практически все необходимое для отдыха. Полуподвальное помещение без окон. Отсутствует кондиционер и вытяжка. Думаю, в жаркую погоду может быть душно. В стеклянную дверь видны только ноги прохожих. Из утвари – отсутствовал острый нож. Dear Guido, WOW! This place is amazing, so cozy and just perfect for our stay here in Amsterdam. Wil was a perfect host and he even took us over to the supermarket to buy some snacks. We definitely plan on returning to Amsterdam and definitely know where we will be staying ☺. Shame we could not meet up this time around, but there’s always a next time. Thank you for making this place perfect and thank you for the wine ☺. Sincerest regards. Really nice to go “home”, after a day of walking and sight seeing, and relax with a nice bath(huge clean tub)and a cup of herbal tea. We also saved money buying a muffin the night before and have our coffee and muffin in the AM before going out. The location is very convenient to all canal boat stops, on a quiet street in a pleasant neighbourhood. I didn’t realize it is a half-basement apartment. You must walk down a few steep steps. Dear Guido, Our stay in Amsterdam has been fabulous! It was a little short but enough to meet a wonderful city. Your apartment is very comfortable, well located and your attention has been excellent. Definitively we will recommend it. We hope to be back soon. Thank you for everything! We appreciated your professional welcome of such a distinctive place. We have had a fantastic time in Amsterdam. Your apartment is 1st class and so central to everyone here: we will definitively be back. Thank you so much! Muito amável nosso anfitrião Guido! Nos recebeu muito bem e nos deu ótimas dicas sobre sua cidade. O apartamento é lindo e tem tudo que vê precisa: cafeteira com café, açúcar, adoçantes, torradeira, aquecedores, guias turísticos, mapas, sem contar que a vista é maravilhosa. Voltaremos quando pudermos. Thanks for your hospitality. Great place & nice city. We’ll recommend your apartment! Thank you Guido: an excellent, quiet, clean apartment in a great location & great value! Dear Guido, Thanks for the nice stay here in Amsterdam. There is everything you need in your apartment. The weather was not so good, but we didn’t care because of the beautiful city and the relaxed atmosphere. Thanks for 4 delightful days in a cozy apartment in central Amsterdam. A bit unlucky with the weather though, but we enjoyed our stay very much. Fantastic food on the Thai restaurant around the corner!!! Regards from Kristin & Bjørn. Thanks for your nice charming apartment. Everything you need in your life you’ll find over there. Conveniently situated room near to the center of the city. Thanks for your hospitality nice kind man! Everything was perfect! You are exceptionally attentive!!! I am sure that my daughter and her boyfriend will return. Thanks for your hospitality! Guido, thank you very much for having us in such a beautiful place you have. Congratulations! You take care of every detail. Hope to see you soon again! Thank you very much for a lovely stay! Great location, would recommend! Thanks again. Sehr sauberes Appartement, geschmackvoll und praktisch eingerichtet; Vermieter sehr nett, hilfreich und engagiert; ideale Lage zur Oper; wir werde es gerne wieder buchen. Kein minus, nur ein Hinweis: die steile Treppe ist nur für Gäste, die gut zu fuß sind. Dear Guido, thank you for this lovely spot: labai ačut! местоположение апартаментов очень удобно: рядом метро, наземный транспорт, в шаговой доступности множество ресторанов, достопримечательностей, музеев, магазинов. район тихий и спокойный. в апартаментах очень чисто, по-домашнему уютно, все в наличии для комфортного проживания – начиная шампуня и фена в ванной, столовых приборов, утюга и другой полезной техники и заканчивая интернетом (с нормальной скоростью и без перебоев). гвидо – хозяин апартаментов – очень доброжелательный, гостеприимный, отзывчивый человек, всегда поможет и откликнется на ваши просьбы. очень приятно внимание с его стороны при бронировании, далее во время проживания и после отъезда. он подскажет куда сходить, что посмотреть и много другой полезной туристу информации, плюс множество карт, путеводителей уже имеется в апартаментах гвидо. I have the privilege of staying here multiple times over the past years and really can’t say enough positive things about it! From cleanliness/ amenities/ attention to detail/ EXTRAS provided by the hosts/ fantastic central location to Amsterdam/ ease of access from Central Station/ EVERYTHING is superb…i have stayed in many privately held properties over the world and none surpasses THE AMSTERDAM CANAL GUEST APARTMENT/ I will (and have) recommend it to anyone seeking great accommodations at a reasonable rate. Super ontvangen door twee lieve aardige mensen (Guido en Kees). Mijn verjaardag weekend was super geslaagd en dit ook dankzij jullie tips en Hollandse gastvrijheid en natuurlijk door het super nette guest house op een super locatie! Dikke zoenen van twee heel tevreden Belgskes! We are very happy to choose this place to spend our New Year Holidays. This is really a home away from home. We had a great time. Thank you Guido, we will be back very soon. Happy Chinese New Year! Dear Guido, we had a perfect time here in your apartment on Zwanenburgwal. The place is perfectly quiet and very intimate. But the very best moment was seeing Amsterdam covered by a snow-white coat, just beautiful. Thank you for your kindness. I use to travel a lot and I like to change hotels to see different things, locations, try their restaurants… Without doubt your apartment is one of the few which I would like to return. Dear Guido and Kees, Thank you for your hospitality, votre accueil chaleureux et pour votre générosité. Nous avons passé une très belle soirée, très conviviale avec vous. Nous avons passé deux jours très agréables dans votre appartement: il y a tout ce qu’il faut pour s’y sentir bien, et l’emplacement est extra pour visiter Amsterdam, même il y a beaucoup de neige et qu’il fout très froid! Car nous pouvais y revenir très vite se réchauffer – a plaisir de se revoir. Thanks a lot for serving a pleasant stay. We missed nothing: not even those little things you never thought of before travelling, like a weightwatcher ☺. As a real host Guido was looking after our needs: he made reservations for us before we could ask him to do so! Thanks for all. Recepção realmente personalizada e excelente localização. WARNING: If you are reading this message, please prepare for a lovely stay and a very very nice host. We loved your apartment, your sympathy and specially your concern with our stay and us. If there is something we could change in this vacation it is only the duration: we would spent more days here. Thank you very much and see you soon! We hebben erg veel plezier gehad in Amsterdam, niet veel gedaan dus ook aardig wat tijd doorgebracht in dit mooie appartement. Bedankt voor je gastvrijheid en voor alle tips die je gegeven hebt. We hebben ook heerlijk geluncht in Puccini. Mooie ligging, fijn bed en bad, hele vriendelijke gastheer met goede tips voor restaurants en activiteiten. Lovely little place, perfect for 2, excellent location, and some good recommendations from Guido. We will be back! Eraldi sissepääs, disainiesemetega tuba. Ei olnud susse ja/või vaiba. Prettige ontvangst, goede voorlichting over de mogelijkheden in de stad. Ruime studio met prima voorzieningen. Perfecte ligging naast het muziektheater. Veel mogelijkheden in de directe omgeving. Many thanks Guido for all your help and friendly information. We really enjoyed our stay. The apartment was very warm, cosy and all the extra touches make it feel like home. We hope to return again sometime in the future and we will definitely recommend it to all our friends. Guido is one of the best flat owners that I have ever met on my life! Excellent hospitality and professionalism! No minor points to this hotel. Great stay, nice place, we will be back again! Dear Guido, Thanks a lot for giving us the opportunity to stay in this great place! ☺ Your city is amazing and we would prefer to stay here rather then going back home. Four days are not enough to discover your city, it is sure we will come back! Kind regards. The apartment is very central and it has extra touches make it feel like home. We have had a brilliant time, made all the nicer with the sunny warmish weather. Tips: Walking tour from Dam square from 11.15 AM until 2:00 PM is well worth the exercise. The Van Gogh’s paintings in the Hermitage building were beautiful. The Anne Frank House is a must. We booked online before arrival and avoided the queues. We also missed our day and arrived a whole 24 hours late, but the kind reception man still allowed us in. Canal Tour. We wanted to buy the ‘Hop on hop of’ for a day but the lovely driver said to buy the cheaper ticket and he wouldn’t stamp it…. He got a good tip! You see Amsterdam from a totally different perspective from the water! The people here have been very friendly and willing to chat to you about their beautiful city. We would like to come back and stay in this guest apartment again, so till then! We had a very nice weekend here in Amsterdam, very much due to the excellent location of this apartment close to all attractions in the city, and still very calm during all day and night! Thanks for all service: we will indeed recommend this apartment to all our friends! Great location, we loved the close to walking to most beautiful and notable sights and we really enjoyed our stay! As the final stop on our trip to celebrate both of our 60th birthdays this year (4 towns in Switzerland, Barcelona and now Amsterdam) we saved the best accommodation for last. The cordial on-site greeting and information (despite us getting in late in pouring rain) was the perfect way to start our stay with you. The attention to detail and all the comfort extra’s like supplying coffee, tea, a fridge and towel warmers made it feel just like home. The city is awesome and we now know why all we have talked to say it’s their favorite destination. We hope to take advantage of your hospitality again and we will tell all of our friends to come and see you. Thanks! Wonderful staying here at Amsterdam Canal Guest Apartment: everything is perfect!! Thanks a lot! Thank you Guido, a wonderful apartment in a wonderful city. We had much fun and we will be back! Dear Guido, we had a fantastic time in Amsterdam: it is such an amazing city! Your apartment is beautiful and I am so glad we chose to stay with you. It is very modern with a traditional feel, quirky & cute. I don’t want to go back home. Thank you very much for making us feel really welcome and showing us some ideas of things to do. We will definitely be back to Amsterdam and we hope to stay here again. Maybe I will even live here in Amsterdam. Thanks again! A lovely place to spend a couple of days, everything we needed, good location and quiet. Dear Guido, Thank you for such a lovely stay in your guest apartment. It is a great location with great views and very close to all action. We look forward to staying with you again on our next visit to Amsterdam! Dear Guido, we had some fantastic days here in Amsterdam. Thanks for your hospitality! Dear Guido, Thank you so much for our wonderful stay in Amsterdam. The view from the bench on the corner is beautiful and has made the stay on your apartment one of the highlights of our trip around Europe. Amsterdam for me has been an inspirational journey. Yet as an artist of sorts, nothing I could draw in this book would compare. I will be back. I love Amsterdam. Beste Guido, wat een mooi appartement! We voelden ons direct thuis en we hebben geen moment het idee gehad in een hotel te zitten. Bedankt voor de gastvrijheid! Dear Guido, we had a really great time in Amsterdam. This place was perfect to stay: for the localisation and specially because for your hospitality. Thanks for everything. We hope we can come back soon. Obrieda por tudo!! Beste Guido, we hebben het fijn en goed gehad. Genoten van Amsterdam en genoten van de geweldige plek. Super gelegen, rustig en van alle gemakken voorzien. Had het eerder moeten ontdekken maar ik zeg het voort. Echt super goed, geweldig, fijn en alles meer. Dank voor alle goede zorgen en zeker tot ziens! Guido, we love Amsterdam and your flat is the best!! Thank you for your smile: he’s very friendly! :)Thanks for your attention and hope to see you soon. The studio is located in the very centre of Amsterdam, with impressive views to the Amstel River. Very nicely decorated, the studio has everything one can need to feel like home. Moreover, the owners showed me the studio in detail, which was very helpful. I had the opportunity to spend some time with them, giving me a very warm welcome. For a solo trip or a romantic holiday in Amsterdam I can only recommend staying in this place, it’s worth it! I will definitely repeat the experience! This is a great little studio in a really good location. We only stayed for one night, but wish it could have been longer. Guido was so nice, I had a welcome email within hours of booking and he kept contact with me until our stay, and even sent a very nice thank you email after. It is the greatest experience I have had with a hotel owner. The room was immaculate. The apartment was very easy to find using Guido’s directions. He also had a lot of information ready for us to explore the local area. I’ve visited Amsterdam around 9 times, and this was by far my best experience. Dear Guido, Thank you very much for your warm welcome. Comfortable, well-thought, not busy, quiet, relaxing and noble, great views from the apartment, classy city! Thank you! Hi Guido, Even we spent only one night here in Amsterdam Canal Guest Apartment we like it here very much. A very interesting and unique room. We will surely come back here again in the future. Would recommend to who ever come to Amsterdam. Well done!! Muchas gracias por contribuir a que nuestra estrada su era muy gratificante. Hermosa comuni da 1 tienen en esta ciudad. The perfect scholar’s retreat: quiet, spacious, comfortable, clean, full of nice little attentions, close to the University’s archives, a stone’s throw away from all kinds of good restaurants and pubs, and within walking distance from the station. All of that for a very reasonable price (also important from a scholar’s point of view…!). Many, many thanks! WOW!! What more can be said but wow, and of course, thank you for being a wonderful host, making us feel welcome and helping to make this a trip of a lifetime for us. We hope to return to Amsterdam and see you again! Bedankt voor de schitterende ontvangst. We zijn zeer te spreken over onze dagen in Amsterdam. Je voortdurende zorg voor de gasten is in alles merkbaar. Je hebt werkelijk in alles voorzien wat voor een bezoeker van Amsterdam van belang zou kunnen zijn. We hebben erg veel baat gehad van je adviezen en we komen heel graag terug. It was really a pleasure to be here. We had a wonderful time. Thank you for all your kindness and hospitality. We come back, for sure! And our friends too! There is only one 5-star accommodation in all of Amsterdam-Zwanenburgwal 296! Your flat is perfect in every way and we could not be happier with our decision to stay with you. We will only return to Amsterdam on condition that your apartment is available. Thanks for being here! We spend a very good time here in Amsterdam, and in the apartment we felt at home! Thank you very much! Merci Guido. Great place, would recommend it any time. Great reception, clean, very well located. Very good recommendations for places to eat, visit, etc. Dear Guido, we had a wonderful time in Amsterdam despite the weather! Your apartment is great, very comfortable, great location etc. Thank you for all your kindness, like we say in Argentina: “Gente como vos, es muy copada”. Gracias por todo, and we will be back soon! Beste Guido, Hartelijk dank voor de fantastische ontvangst. We waren ontzettend tevreden over je appartement: een heerlijk stil plekje, met een heel bijzonder uitzicht. Wanneer we opnieuw in Amsterdam zijn, zullen we beslist weer bij jou willen logeren. We enjoyed our stay in Amsterdam very much. This is partly because we felt a little bit the true native ‘Amsterdammers’ in this nice, stylish and comfortable apartment. Thank you very much for your hospitality. Guido en Kees: ongelooflijk gastvrij, een heerlijk appartement en een geweldige stad. Bedankt voor de quality time die jullie ons samen boden: we hebben enorm genoten. Tot gauw in het Brabantse! Muchas gracias por todo Guido, tienes unos apartamentos ideales con todo lo uve uno pueda desear. Ha sido genial. Nos vemos a la próxima!! Un beso muy fuerte de Agata & de Cristian from Sitges, Spain Ciao!! Everything about this guest apartment was amazing. From the first contact by the owner (Guido), to the late check-out when I left – nothing was to much bother. The location is nice and quiet but central (just a short walk to the main centre), local cafe’s and restaurants (especially the Thai round the corner) were really good, the apartment had absolutely everything you would need for a relaxing break, and it was spotlessly clean. Oh and a lovely welcome complementary bottle of fizz was a really nice touch. I would not hesitate to stay here again and would certainly recommend it to anyone. We’ve been traveling for 8 months now and this place has not only been the best place we stayed, it also allowed us to feel home away from home for such a long time! The owners are very accommodating and are genuinely honest and real people! We enjoyed our time here because of so many factors such as comfortable clean bed, pillows etc., perfect temperature, great location, spacious bathroom and most of all quite and close to all the best coffee shops and breakfast places. Thank you! Thanks for a great stay, amazing location and superior hospitality. I will surely return! Thanks Guido, I had a great time. The apartment and its location are great! Dear Guido, What a wonderful place for beginning the New Year!! Many thanks for your kindness and we hope to come back soon to this amazing city: we really enjoyed!! Lovely stay in a lovely flat in a lovely city! Many thanks Guido!